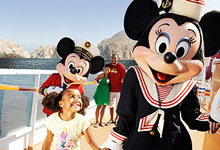 Disney has announced a new Disney Cruise Line deal - Kids Sail Free to the Mexican Riviera! This offer allows kids 17 and under to sail FREE when traveling with two full-fare guest in the same verandah stateroom (categories 4A - 6A) on most Mexican Riviera sailing. Offer is good for sailings October 30 - December 18, 2011. *This offer is only available to residents of the United States and Canada. Offer applies only to verandah stateroom categories 4A-6A (excluding suites and concierge) for most sailing dates October 30 - December 18, 2011. The number of staterooms allocated for this offer is limited. There are also a limited number of staterooms for four or more guests. This offer can't be combined with any othe special offers or discounts. Additional Terms and Conditions apply. To get a FREE price quote or to book this deal contact me at magicaljourneystravel.com/kristendcl. I'm a Disney College of Knowledge graduate and agent for Magical Journeys, an Authorized Disney Vacation Planner.